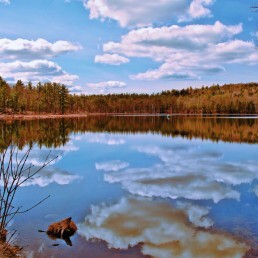 Owned and managed by Maine DIFW, Chandler Mill Pond in New Gloucester is one of the Royal River’s few headwater ponds. 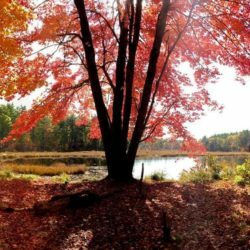 This 47 acre pond sits on a 117 acre forested parcel and has a hand-carry boat launch for water access, wiht a wheelchair accessible path leading to the pond and launch. The pond is near New Gloucester’s growing Upper Village, and just miles from the Auburn city limits. 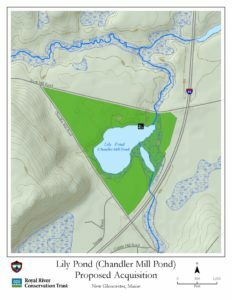 Chandler Mill Pond and its immediate watershed are nearly entirely undeveloped; the pond supports a high quality trout fishery with free public access. The pond is very productive and has produced exceptional fishing for brook trout, including trout of noteworthy size. Since 2007 the pond has been exclusively managed for rainbow trout. 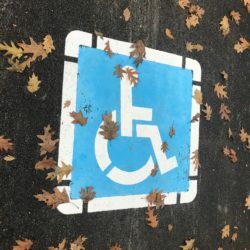 Maine DIFW in 2018 constructed a modern hand-carry boat access facility with a 1000 foot paved wheel-chair accessible trail between the parking area and the pond. Very informal woods trails begin at the parking area. The formal boat access point is on Snow Hill Road in New Gloucester. From New Gloucester Village head northwest on Intervale Road (Route 231) for 1.9 miles. Intervale Road turns into Bald Hill Road after crossing Route 100. Continue straight for 0.3 miles. Turn left on Shaker Road/Snow Hill Road for 1 mile. The turn off to Chandler Mill Pond’s boat access parking lot will be on your left, soon after the Turnpike underpass. Other portions of the shoreline on Chandler Mill Road provides informal access. The long-time landowners transferred the parcel to the Maine Department of Inland Fisheries & Wildlife (DIFW) on March 22, 2016. The parcel has thus become a state wildlife management area, managed for its exceptional fishery. A portion of the appraised value of the parcel was donated; the remaining appraised value was paid for by DIFW using federal Dingell-Johnson Act sport fish restoration and boat access funds. RRCT played various important roles to assist with project management. Here are some historic photos of the Chandler Mill. Here is proof that there are too many Lily Ponds in Maine. “If necessary that “Chandler Mill Pond” be viewed as honoring and individual, rather than the mill or road or place or history generally, the Royal River Conservation Trust recommends honoring Charles Peleg Chandler who was born on August 14, 1857 and passed away on November 1, 1926. “He and his three brothers bought the mill from their uncle in the 1890s and were known as the Chandler Brothers. However, Charles Peleg soon bought out his brothers and it became his operation on the Lily Pond. Please plan to pack out your own trash as well as any left by others to improve the experience for everyone.